Do you have a GPS signal on board of a plane? Does anybody know if there is a GPS signal available on board of a plane with a common and normal GPS receiver? Unfortunately the plane body does an excellent job of blocking GPS signal. In general if you're in a window seat you will be able to get a signal by holding the GPS near the window (or, for example, on a tray table) - but if you're elsewhere on the plane it's very unlikely you'll get a signal. The exception to this may be the new Boeing 787, which is made primarily of Carbon-fiber reinforced polymer (CFRP). Not only does CFRP allow for larger windows (which would allow a greater visibility of the sky, and thus more GPS satellites), but it's likely that the GPS signal would pass through the aircraft shell better than on conventional planes. Keep in mind that not all airlines allow passengers to use GPS receivers in flight (they are technically "radio receivers" which are often not allowed). Be sure to check with the specific airline and/or the flight crew to confirm that you are allowed use one. Yes, but the signal can be a bit weak. It's best to hold it to the window to get a lock. Depending on the GPS device, some are able to "hold onto the lock" even if they are not facing the window, so you only need to have it by the window for the initial lock. You may or may not be allowed to have it in the GPS. 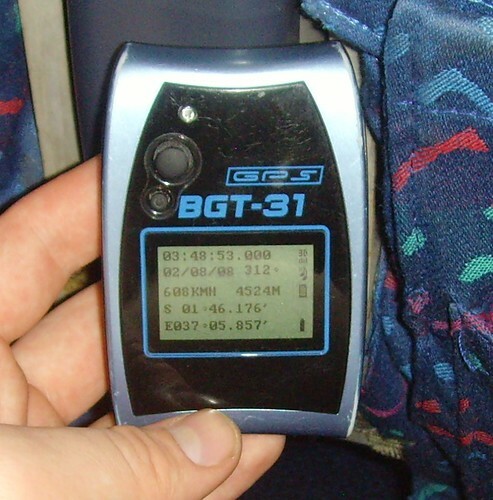 Here's my GPS while I was travelling near the equator. Look how I'm 4,500 m above sea level and travelling at 600 km/hr. Depending on the seat location, and position of the GPS satelite constellation, my reception varies from mediocre to excellent. With a newer iPad, possibly containing a better chip or antenna, my capture rate for good position is generally over 90%, with the proviso that a window seat be selected. Aircraft type seemed unimportant - until my most recent commercial flight. On the outbound leg, over 10 hours on a B777, I enjoyed superb capture and positional accuracy. The return leg was on a B787, and over the more than 10 hours of flight time I received not a single fix, even with the iPad up against the (large) window. Indeed, I wonder if the 787 has some kind of GPS jammer in the cabin, since the GPS signal actually occasionally showed 1 meter accuracy, but without an actual location, and then immediately dropped to "No Fix" - so it seemed that an extraneous signal might have been present. BTW it is worth noting that a number of highly experienced pilots have recently landed at incorrect airports, with several such events well publicized. An iPad in the cockpit, running one of the readily available aviation programs, would have avoided such embarassing - and potentially dangerous - events. Yes, I did have GPS reception on my cellphone during a flight. However, it took quite a long time to get the initial coordinates, and I could not get updates on my location very often (the coordinates changed maybe once every 3-5 minutes). So I would say you would have bad reception in the best case. Maybe dedicated GPS devices would have a better antenna & reception than my $300 phone. I have flown (as a pilot as well as a passenger) with a variety of GPS units (hand-held Garmins, iPhones, iPads), in a variety of aircraft, from my own single engine plane up to the largest commercial, with the portable GPS unit providing excellent position, speed and altitude information. Indeed, my iPad correlates superbly with my Garmin GNS 530, and serves as a backup for the (certified) Garmin unit. an iPad and iPhone can (and most do) contain a 'real' GPS unit. Some information can be obtained by triangulating cell phone towers, but cell reception can be turned off, or the unit can be in the middle of a cell-free zone (such as an ocean) and GPS service continues. an iPad of iPhone, with the cell system configured to 'off', will not interfere with aviation electronics. In that configuration, the unit is in 'receiver mode' only. However, please do turn the cell phone portion of the unit off! The fuselage of most commercial aircraft will allow sufficient penetration of the satellite-transmitted GPS signal to permit excellent accuracy. I have flown extensively while receiving good signals - in a large variety of aircraft, including regional jets, B737, B757, B777, MD80 etc etc. I have only flown in a B787 twice - and in NEITHER CASE WAS I ABLE TO RECEIVE A USABLE GPS SIGNAL. I had a window seat both times, each flight was in excess of 10 hours, and at no point did I receive even a marginally usable signal. I presume the fuselage of the B787 contains denser EM shielding than the typical aluminum skinned airplane - probably related to lightning protection requirements for the nonmetallic structure. I tested this once on a flight which claimed it was fine, once you'd taken off, and not during landing - to use devices like this. I have an app on my phone (MyTracks) which is meant to track you when running, for example, but I just turned it on and left the phone running in my pocket. Not ideal for GPS, but I was in a window seat, giving it a slight chance. Long story short, there were some data points recorded during the flight, and at a range of altitudes. It wasn't a steady connection, but it was certainly received intermittently, until the final 'please turn off all electronic devices' warning came and I had to stop the test. I have a Garmin Oregon 550 and I can confirm that one can get a decent signal if the reciever is positioned close to a window. Getting the initial fix might take a few minutes, however. For all the flights where I did not have a window seat, I lost the signal sooner or later and never got a fix again. My experience is, that different airplanes actually do make a difference. I remember having excellent signal in a Boeing 747 Jumbo, while in Airbus A340 the GPS reciever would have to be close to the window all the time to prevent it from loosing the signal. I can also confirm from a recent flight that in the Boeing 787 Dreamliner there is absolutely no signal at all, not even close to the doors or emergency exit. I didn't expect this at all due to the plane being made of carbon fibre which normally transmits the GPS signal. I figure that at least the windows are (electrochromic) smart glass windows and they therfore don't transmit any GPS signal. So holding the GPS device close to the windows doesn't help in a 787.
putting the phone flat against the window and pulling the shade down to hold it there. My Garmin eTrex-30 claims to get 3-5 meter accuracy when held against the window, but drops to ten meters in my lap (and frequently claims to have lost signal). Also, I don't trust its accuracy claims because once out in the open, it mapped two fixes twelve meters apart when both were actually taken at the same spot and it claimed four meter accuracy. I just used my Android phone GPS app to clock the plane's touchdown speed yesterday. The plane was an Airbus A320 , I was seated at the window. The plane's touchdown speed was about 250km/h. It was not easy to clock the speed at landing using an android app because the pilot seemed to apply brake at the same moment of touchdown causing a steep velocity change within subsecond interval. The Android app GPS status refreshes only once per second. But, tracking the flight's location was very accurate. I saw the shore line of Detroit dotted with 2-3 nuclear plant cooling towers, and surely enough the Google map pointed my location at the Lake Huron shore. As others have already said, it works in most airplanes, but in the dreamliner specifically (787), it will not work due to the fancy windows that can dim themselves but also contain a conductive material that prevents the GPS signals from getting in. It's not GPS jamming, but just unfortunate GPS shielding. Source: I use my Garmin GPSes in all airplanes I've taken, they've always worked next to the window, except in all dreamliners I've flown in. Used galaxy A5 with google map and FLIGHT MAP free inside A320 NEO and Boeing 737-800 with excellent Gps fix (on window seat)for a complete 3 hour flight without any problem.Just turn on gps asap once inside plane or do it even before before bording the aircraft and put phone on flight mode. Not the answer you're looking for? Browse other questions tagged air-travel gps-navigation or ask your own question. Longer latency on GPS connection depending on which country I'm in? Does anyone make a single device that does GPS navigation and tracking?